For the Living of These Days finds Kate Campbell returning to the rich, deep wells that have sustained her musical journey since 1995’s Songs from the Levee. That debut album introduced her as an artist tapped into the Southern literary bloodline of Flannery O’Connor and William Faulkner. An abiding fascination with storytelling, race, religion, history and the day-to-day happenings of people’s lives continue to fuel Kate’s creative pursuits on this collection. Similarly, an ongoing love affair with the musical traditions and folkways of her native South led her to once again record at the hallowed Fame Studios in Muscle Shoals, Alabama and choose the legendary Spooner Oldham as her musical partner for the project. Kate’s relationship with Spooner goes back to the 1960s when she became fascinated with the sounds emanating from Muscle Shoals on tunes such as Percy Sledge’s “When A Man Loves a Woman” and Aretha Franklin’s “I Never Loved a Man (The Way That I Loved You)” – which are but two examples of Spooner’s vital contributions to American music. He would go on to record and perform with some of music’s most celebrated artists, including idiosyncratic icons Bob Dylan and Neil Young, before meeting Kate in 1995 during a chance encounter at the office of Fame Publishing in Muscle Shoals. After opening a few shows for Spooner and his longtime writing partner Dan Penn, Kate invited Spooner to play organ on her 1997 release Moonpie Dreams. He’s appeared on nearly every one of Kate’s albums since, including 1998’s Visions of Plenty, 1999’s Rosaryville, 2001’s Wandering Strange and 2003’s Monuments, providing a direct link to the Southern soul Kate counts as a primary source in her music. As with most of her albums, Kate spent several years thinking about what approach to take with the project that would become For the Living of These Days. People kept asking her for another album similar to 2001’s Wandering Strange, which found Kate recasting the hymns she’d grown up singing in the Baptist church in her favorite musical style: ‘60s soul with a heavy dose of the Muscle Shoals sound. Still, she wasn’t quite sure how to go about doing a second gospel album until someone gave her a copy of Mavis Staples and Lucky Peterson’s 1996 album Spirituals and Gospels: Dedicated to Mahalia Jackson – which takes a bare bones approach to Mahalia’s tunes with just Staples on vocals and Peterson on Hammond B-3 organ and piano. Kate’s thoughts quickly turned to Spooner as an ideal musical partner for a similar project because of his easy going nature and his willingness to take chances and capture the moment in the studio. With 2005’s Blues and Lamentations, Kate had used a minimal number of musicians and begun capturing more moments live in the studio, but For the Living of These Days would turn out to be her most in-the-moment recording to date with many of the performances recorded in just one take. When choosing the songs for the album, Kate returned once again to her favorite source materials: her parents’ small but vital record collection, the Baptist hymnal, classic folk, soul and country music, and the pens of Alabama’s finest songwriters. As a child, Kate was raised on the gospel records of Mahalia Jackson, Pearl Bailey and Elvis Presley, where she first heard “There is a Balm in Gilead” and Mylon LeFevre’s tune “Without Him.” These songs, along with “God of Grace and God of Glory” and “There’s a Wideness in God’s Mercy” appeared in the Baptist hymnal Kate would read through in church when she got bored with the sermon. Hymns became an essential part of her musical DNA, and Kate returned to the hymnbook for inspiration while in college and, later, as she embarked on her music career. Through the years, Kate has continued her own spiritual journey and found herself drawn to the life of Christ and what he said about how human beings treat one another, also referred to as the Social Gospel. This idea is established as a theme of For the Living of These Days with Woody Guthrie’s “Jesus Christ” chosen as the album’s opening tune. The idea of Jesus’ teachings in the present day is established as a foundational element to the album with Guthrie asserting that Jesus Christ’s message would end with the same result if he were to preach it to the citizens of New York City circa 1940. The same idea reappears later in the album with Kris Kristofferson’s “They Killed Him,” which name checks 20th century peacemakers Mahatma Gandhi and Martin Luther King, Jr. alongside Jesus Christ as leaders and teachers whose messages got them killed. In a similar vein, Bobby Braddock’s “Would They Love Him Down in Shreveport” presents the idea of Jesus Christ making wine from water and hanging out with prostitutes and thieves in modern day America and the possible reactions of stunned churchgoers if he were to take such actions in their backyards. The idea of denying pivotal events such as the Holocaust and Trail of Tears is also addressed in Kate’s own tune “Terrible Mercy,” – co-written with yet another Alabamian, Mark Narmore. Though “Terrible Mercy” points out the quite popular “solution” of just turning a blind eye to the world’s problems, the chorus of this song points to a very present remedy — mercy. In fact, the harsh realities faced throughout the album are tempered with a heavy dose of mercy beginning with the second song, “If I Ever Get to Heaven,” which Spooner and Kate co-wrote as a musing upon what the hereafter might actually be like. These remembrances of mercy continue with the inclusion of hymns such as “God of Grace and God of Glory,” “There’s a Wideness in God’s Mercy,” the Celtic strains of “Be Thou My Vision,” and another original tune “Dark Night of the Soul,” which Kate wrote with long-time collaborator and Alabama native Walt Aldridge. Inspired by the writings of the 16th century Spanish mystic Saint John of the Cross, “Dark Night of The Soul” is followed by the Southern Gospel-steeped “When I Let Jesus Take My Hand,” another original song written by Spooner and his wife Karen while driving home to Muscle Shoals in the midst of a dense fog. Though they use two different styles of language, Kate feels both “When I Let Jesus Take My Hand” and “Dark Night of the Soul” convey the same topic of letting go and allowing a higher power to guide though difficult times. This guiding mercy is also evident in “The Prayer of Thomas Merton,” which is an actual prayer taken from the Trappist monk’s 1958 book Thoughts in Solitude. Both Kate and her husband, Ira, were drawn to the prayer for its portrayal of the uncertainties involved in daily living and the assurance of God’s faithfulness. One day earlier this year, both Kate and Ira separately had the same idea that she should put the prayer to music, which all but sealed its appearance on For the Living of These Days. Perhaps the most arresting pictures of mercy and hope on the album are reserved for the two closing tracks beginning with “Faces in the Water.” Written by native Alabamian Dr. Greg McPherson, the song refers to the recently erected Civil Rights memorial in Montgomery, Alabama honoring those who gave their lives, both literally and figuratively, for racial equality and peace. The album’s closing hymn “There is a Balm in Gilead,” speaks as both an assurance of rest after this life and a comfort to those still battling with a “sin sick” soul here on earth. Kate was drawn to the sense of healing and hope heard in the song…that one day all will be made right and the chains that bind on earth will be broken. As with any Kate Campbell album, repeated listening to For the Living of These Days is strongly suggested since the songs tend to take on deeper or different meanings over time – even for Kate herself. After the last note has faded on this album, Kate hopes the listener will have come to a wider understanding of both the genius of Spooner Oldham and the messages conveyed in these songs and the lives that inspired them….may they offer guidance, encouragement, and hope for the living of these days. Emmylou Harris once sweetly grumbled that “the living room has gone out of the music.” She meant that Nashville had moved from homemade country music to a high-tech studio sound that eliminated mistakes but also emotion and spontaneity. Kate Campbell’s For the Living of These Days is living room music. You get the feeling – in this case, a good feeling – that Ms. Campbell is on the other end of the sofa, pouring out songs of faith. She and music partner Spooner Oldham confine themselves to guitar, piano, electric piano and Hammond B-3 organ. Some selections were done in one take. The CD contains a mix of hymns and contemporary songs that no commercially minded producer would indulge. Woody Guthrie is represented by the rather angry “Jesus Christ,” and Kris Kristofferson with the angrier “They Killed Him.” Both bear witness to the danger of living out Jesus’ message fully. With a low, rangy voice, Ms. Campbell does wonderful renditions of gospel tunes, including Mylon LeFevre’s “Without Him.” She’s strong on the hymns, such as “God of Grace and God of Glory.” Her riskiest effort – one with great emotional payoff – is to set to music a prayer of Thomas Merton. That tune, like the entire CD, offers a grownup faith, encompassing doubts and hard times. If He said give up your money? “Prayer of Thomas Merton,” written by the celebrated Trappist priest/monk, is a gorgeous performance, sung with deep feeling by Campbell to Oldham’s understated organ accompaniment. The melody will be familiar to most Southern churchgoers, as will Harry Emerson Fosdick’s 1930 “God of Grace and God of Glory,” which we used to hear around Thanksgiving. The title of Campbell’s new album is drawn from Emerson’s 1956 biography. Oldham and Campbell wrote some of the album’s most effective music. A drive home through a thick fog in the Tennessee Valley inspired Oldham and his wife, Karen, to compose “When I Let Jesus Take My Hand.” The bare-bones performance adds to the song’s simple power. Musically, Campbell and Aldridge’s “Dark Night of the Soul” begins like Paul McCartney’s “Let it Be” but 16th-/scentury Spanish mystic St. John of the Cross inspired the lyrics. Campbell sings beautifully throughout, her middle Tennessee accent a prominent part of the proceedings. On some of the songs, Oldham offers a soft vocal harmony or counterpoint. The fact that they’re able to convincingly perform some of the weaker material, like Kris Kristofferson’s “They Killed Him” — compare it, if you will, to Dylan’s bizarre recording — is a testament to the spirit-flame that warms and illuminates this album. Kate Campbell and southern soul architect Spooner Oldham have crafted some memorable moments together in recent years, but in the gospel-oriented For the Living of These Days, they have reached a depth of feeling remarkable even for their collaborations. There’s nothing fancy here: Campbell simply opens up her heart, digs into her soul, and feels to the core every message she imparts with such gentle urgency. Oldham supplies a few humble background harmonies, but his main role is to buttress Campbell’s stately vocalizing with down-home, backwoods church piano and organ. Spare and respectful, reverent and transportive, these performances beg only to be heard. Campbell doesn’t exactly take a noncommital stance here, though; rather, she wears her topicality with appealing demureness. In Bobby Braddock’s “Would They Love Him Down in Shreveport,” she renders Christ’s tribulations with bemused sweetness, over Oldham’s rich organ chording. In “Jesus Christ,” which Woody Guthrie modeled on his rewrite of the traditional outlaw ballad “Jesse James,” Campbell, accompanied only by her softly strummed acoustic guitar, describes misunderstood historical figures, each betrayed by a “dirty little coward,” each aligning himself with the downtrodden, each meeting a violent end. Gentle, organ-fueled pleas (“Be Thou My Vision”), acoustic guitar-and-organ exultations (“God of Grace and God of Glory”), and a moving, searching, nearly a cappella rendering of the African-American spiritual “There Is a Balm in Gilead,” suggest the varieties of religious experience in a thought-provoking style that is sneakily didactic but intensely mesmerizing. There’s no sacrilege intended in terming this spiritually minded collaboration a match made in heaven. Kate Campbell has won a loyal folk following with her purity of tone, literary inspirations, and depth of moral vision. Spooner Oldham has supplied soulful keyboards behind artists ranging from Percy Sledge and Aretha Franklin to Bob Dylan and Neil Young, and has further distinguished himself as songwriting partner of the great Dan Penn. This collection of hymns and contemporary material in a Christian vein benefits from the stripped-down intimacy and one-take immediacy of their performances as a duo. “If I Ever Get to Heaven,” a Campbell-Oldham composition, speculates on the afterlife, but the most pointed material concerns the religion’s radical message for life on earth, with Woody Guthrie’s “Jesus Christ,” Bobby Braddock’s “Would They Love Him Down in Shreveport,” and Kris Kristofferson’s “They Killed Him” each suggesting that a second coming could result in another crucifixion. Whereas some of the more traditional-sounding material, such as the Irish “Be Thou My Vision” and “There’s a Wideness in God’s Mercy,” stresses the comforts of religion, original material from Campbell—including “Dark Night of the Soul” and “Terrible Mercy”—explores the complexities. Whatever the message, Oldham’s gospel piano and bedrock organ are worth hearing on their own. Although country and Anglo-American folk have a lot of common heritage (both are descendants of Celtic, Welsh, and British folk), the two have often parted company in a big way when it comes to political and social attitudes. Folk has long been a bastion of liberal activism, whereas country is one area of the music world in which neocons are not hard to find — which is why the Dixie Chicks caught so much flack for criticizing the George W. Bush Administration in 2003 (no one on the folk circuit is going to boycott Ani DiFranco or Phranc for opposing the neocon agenda). Folk audiences, on the whole, are disdainful of the modern country/pop/gospel artists who openly support far-right organizations like the Christian Coalition, but that doesn’t mean that folk has to be secular or that the folk scene is anti-religion — and For the Living of These Days is a perfect example of a Christian-themed folk album. 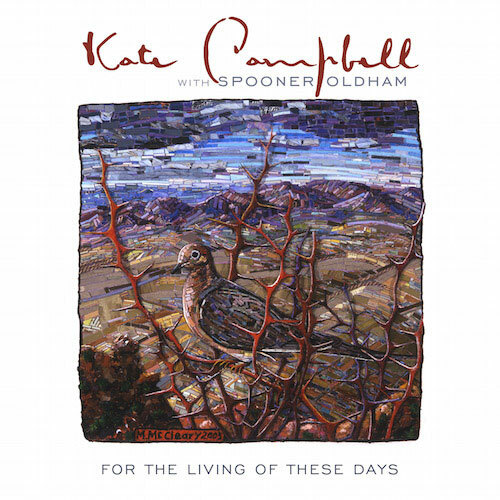 With this 2006 recording (which boasts Spooner Oldham on piano and organ), Southern singer/songwriter Kate Campbell maintains both a Christian focus and a folk orientation. This 45-minute CD is definitely country-influenced, but the performances are more folk than country; that is true on Campbell’s own songs as well as inspired performances of Woody Guthrie’s “Jesus Christ,” Bobby Braddock’s “Would They Love Him Down in Shreveport,” and Kris Kristofferson’s “They Killed Him.” For the Living of These Days is not a heavily political release, and yet, some of the material does acknowledge the more liberal/progressive strains of Christianity. “They Killed Him,” with Kristofferson’s favorable reference to Hindu activist Mahatma Gandhi, is not exactly typical of the sentiments one associates with a Jerry Falwell sermon. Bottom line: For the Living of These Days is excellent as both a Christian album and a folk album.